My play Purnjanam/Born Again will be part of a double pill called Tagore’s Women. We did a workshop with a bunch of writers and the lovely Elizabeth Freestone exploring Tagore’s plays… I had never read Tagore – apart from a little poetry – and so these were an eye opener. His work is poetic and simple at the same time. He was very progressive in terms of social and even environmental issues. 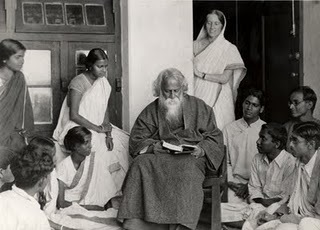 Of great interest was his use of the female protagonist – although many may talk of Tagore as a pro-Feminist I would perhaps not go that far. But his female characters are well formed and definitely step out of the thick lines of societies expectations. They were definitely progressive. Even in his short stories (which are fantastic) and the beautiful Charu (dir bySatajit Ray) there is such a sense of place and beauty.. . Needless to say, I enjoyed reading his work and was particularly inspired by the magical and mystical elements. In a city of transition and tradition, three liars, two lovers and a reluctant leader all desperately search for their own truth. Exploring class, gender and sexuality, Purnjanam questions destiny, love and power.